A pilgrimage is a journey undertaken in light of a story. A great event has happened; the pilgrim hears the reports and goes in search of the evidence, aspiring to be an eyewitness. 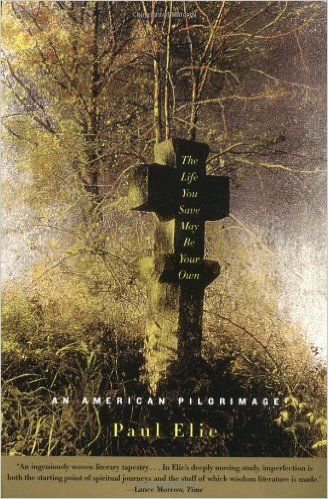 The pilgrim seeks not only to confirm the experience of others firsthand, but to be changed by the experience. The story here is a well–known one: First Jesus, then Peter (+keys), then lots of other popes, and now this one. I’m not unique in being fascinated by what Pope Francis has done since bowing his head and asking for the prayers of the world on the day he was elected. 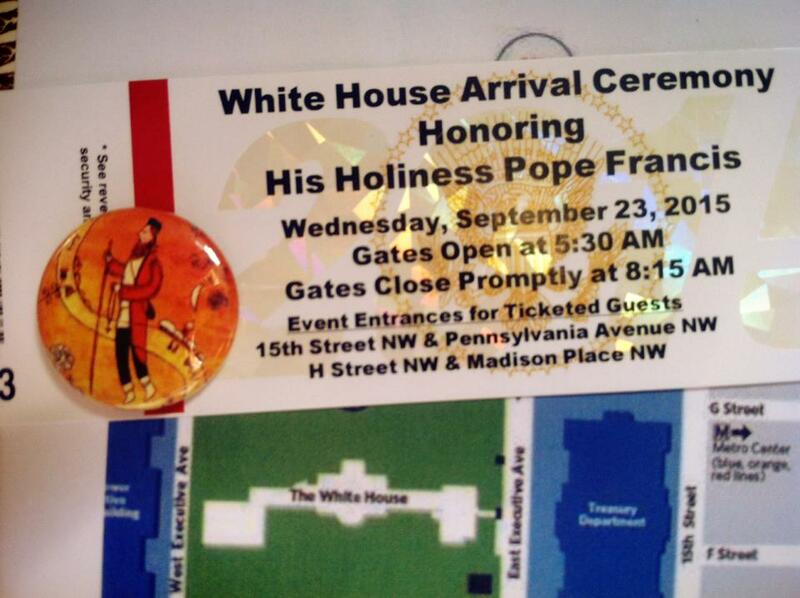 Nor was I alone in traveling to Washington, DC, on a pilgrimage of sorts to see Pope Francis. I was offered a ticket to Wednesday morning’s White House Arrival Ceremony by my wife’s friend and former work colleague, Terri Payne. She was interested in attending herself, but generously offered me her ticket, aware as she is of my professional and personal love of all things Catholic (and Pope Francis is very much among those things). I saw the pope. And now I wonder how I might have been changed by the experience. That we travel at all to a specific place at a specific time so as to see with our own eyes one particular person is a deeply sacramental thing to do. The Sacraments—outward signs of interior grace—stand at the heart of the Catholic faith and give rise to (or are engendered by) an entire sacramental imagination that engages the world in faith that each place, moment, and person can be the means for an encounter with God. For example, the gift of a ticket, the support of my wife, and a shared conversation, can all be an experience of grace. Notice I did not say that they could remind me of grace, or direct me to grace. Rather, these actions can all be the very means by which God reaches out to me. So too, can the journey to DC to see one man who—by virtue of his office—serves as the living sacramental sign of the ultimate unity of the Body of Christ (even in our very clear and all too painful brokenness). 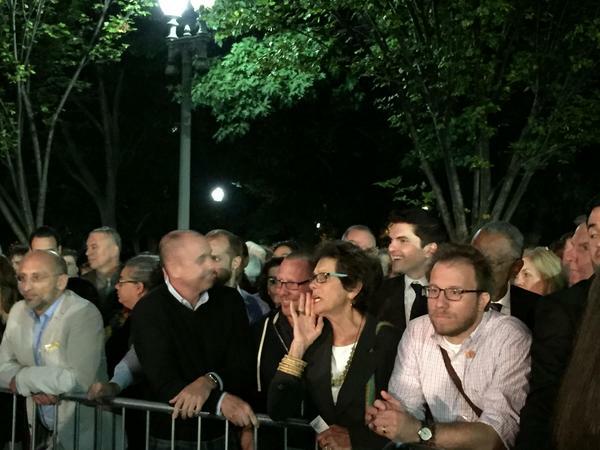 When I arrived at the White House at 5:00am, the line already stretched several city blocks. But all considered, being several blocks from the front was still a good position amidst the some fifteen thousand expected for the South Lawn ceremony. We passed through check point #1, but things quickly turned frustrating. For some reason that will undoubtedly never be made public, the usually well-organized Secret Service had a wrinkle in their security lines: my line stood still for an hour as I watched thousands file past us in other lines. We were all understandably frustrated. I grew angry, fearing that my chance at a good view of the pope was slipping by me in the other lines. But as people behind me were chanting for a change, many began to holler at the Secret Service officers who were standing guard. As adjusting security measures is beyond any single officer’s power, the yelling brought forth no change. But I heard one woman in line say something about how happy she was to see a group of high school students pass us by in another line. “I hope and pray,” she said, “that they get a good spot to see the pope and that it makes a difference in their faith.” Humbled, I looked around at the faces of those around me. We all really wanted to see the pope. And no, it was not fair that others were passing us by, but what was fair about my being able to see the pope in the first place? I was given a gift for no reason other than the goodness in Terri’s heart. And maybe this would be a graced moment for some of those who were able to get a better position than I would. I sought to follow the woman behind me and tried to pray. By the time I got onto the South Lawn, I was directed to the section in the far back. I forgot my prayer for a few minutes as I indulged in a bit of self-pity, but was invited out of myself again. 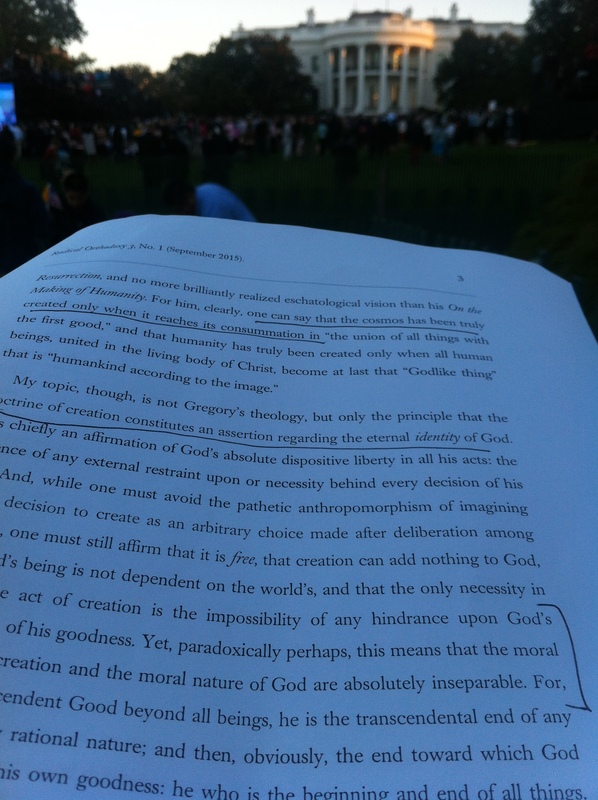 With a couple of hours to go before the pope was scheduled to arrive, I tried to get some work done and stood reading a provocative article by Eastern Orthodox theologian David Bentley Hart. What resonated in this context was his argument that the doctrine of creatio ex nihilo—that God created from nothing and for no reason other than God freely wanted this good creation—puts infinite and eternal value on each particular thing: “But the story we tell, of creation as God’s sovereign act of love, leaves no room for an ultimate distinction between the universal truth of reason and the moral meaning of the particular and the moral nature of God.” All of creation, he continues to say, is theophany—a revelation, a disclosure, of the true nature of God. Good theology, I’m happy to have realized, has the power to make even the White House look small. It relativized the dissonance of the Vicar of Christ being greeted by a fanfare of trumpets and a parade of rifles and put an extra sharp point on the fact that of the four Americans Pope Francis held up as models of imitation during his speech to Congress, three of them (Martin Luther King, Jr., Dorothy Day, and Thomas Merton) spoke out vociferously against nationalism and the military-industrial complex. Good theology relativized my less-than ideal vantage point and held up to me one thought that kept asserting itself in my mind: what matters here are the people—each in his or her particularity—who might be changed by this encounter with this one particular man—the people who might be invited to grow closer to God. MJ offered the class a sparring partner worth engaging, and one who was willing to be public with her own intellectual growth as she would develop her thinking and change her mind. She wrote with delicate nuance that spoke of an appreciation for how various definitions of human reason shape the complicated relationship of faith and reason. But it is her critical examination of herself that sets her apart from her peers—she was ready and willing to learn and adapt to new information. Sitting with her on Wednesday morning, I was impressed by how much she was still the woman who I remember from class. Engaging and interested, she asked questions about my research and my teaching and told me about her own desires to study either international or human rights law. She noted, too, that it was in our course together that she began to find her voice. Encouraged as she was by her understanding and involvement with admittedly difficult religious and philosophical texts, she began to identify the foundational meaning of her life and be able to confidently give voice to her thoughts. 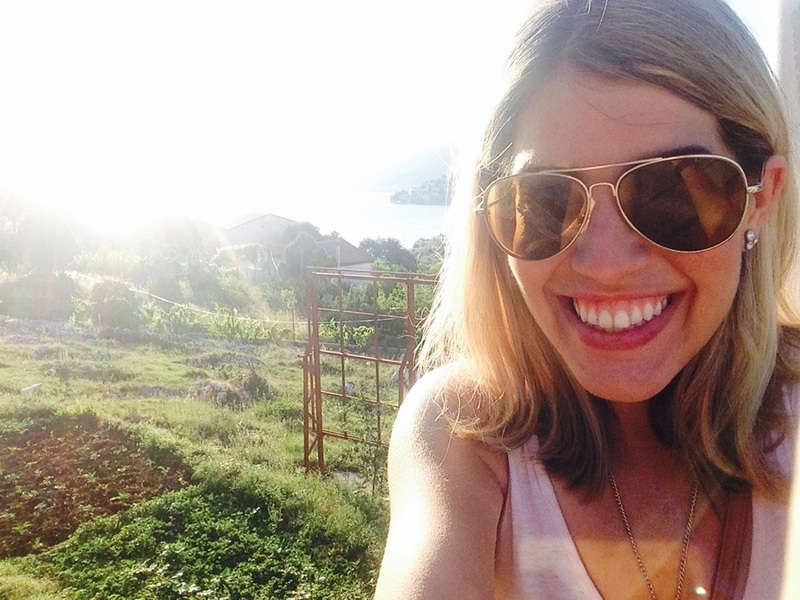 And now she is turning her impressive mind and heart toward peace and care for others. I next walked to The Tombs—the restaurant of choice for Georgetown students and alumni. There, I had lunch with Yadira Vieyra—a student whom I had gotten to know through Georgetown’s Campus Ministry and who would eventually become both a babysitter for our young children and a friend. She is now in the middle of researching the bond between mothers and their young children, looking for ways to strengthen families in her home community in Chicago. 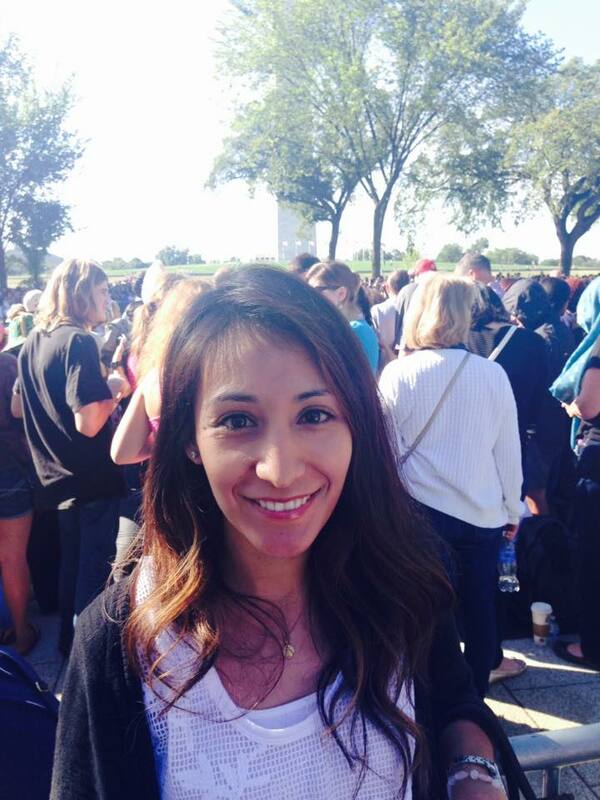 With doctoral work on the horizon, she took a week off of work and traveled to DC to be able to be in the House chamber as the pope addressed Congress. But it was her story of seeing the papal motorcade that I want to share here. Waiting to see the pope as he drove by, Yadira found that her camera battery was exhausted and she would be unable to take that all-important photo of the pope. At first disappointed, she the resolved instead to be joyful and present in the moment. She would get to see the pope drive by—this would be enough for her. It would be a joy. That I was able to see the pope was good. That alone would have made my trip worth my time. But I realized as I sat in the Tombs that the destination of my pilgrimage to DC was not the White House or an encounter with the pope. What matters, I was reminded as she spoke, is that people are transformed—that they are invited to a deeper truth about what ought to matter to us and why. My conversations with these two particular women were moments of grace for me, moments made possible by the generosity of a third. In describing the Church’s sacramental imagination, the fourth century theologian Cyril of Jerusalem observed that “others merely hear; we see and touch.” That’s why we go on pilgrimage. Not just to hear, but to see and touch, to share coffee and lunch in particular places with these people. To be reminded that God is always already active in and though this world. And to have our hearts touched by the grace that cannot but transform us. And for this, I give thanks.